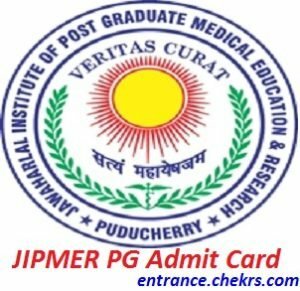 JIPMER PG Admit Card (जेआईपीएमईआर पीजी एडमिट कार्ड) 2017: We are here with a good news for all those candidates who are searching for the JIPMER PG Entrance Exam Hall Ticket 2017 that is necessary for the candidates to carry with them while appearing in the entrance exam. The Jawaharlal Institute of Postgraduate Medical Education and Research has dispatched the dates for releasing the JIPMER MD/ MS Admit Card 2017 officially at its portal. The PG entrance exam will be conducted on 21st May 2017 and the candidates will be able to download their JIPMER DM/ MCh/ Fellowship Admit Card 2017 between the dates 03rd May to 21st May 2017. All the candidates should make it sure that they are carrying a valid photo ID proof along with the hard copy of the exam hall ticket, as, without it, no candidate will be allowed to appear in the examination. For appearing in the PG entrance exam, it is compulsory for all the applicants to carry the JIPMER PG Hall Ticket 2017. The admit cards will be released online at JIPMER official website on 03rd May 2017 and the candidates will be able to access it until the date of the examination. The exam will be conducted on 21st May 2017 at various exam centres. The Hall Ticket of JIPMER PG Entrance Exam 2017 contains the name of the applicant, DOB of the applicant, Photo, Signature of applicant. Name of the exam, day, date of exam, the time duration of exam, exam center details and exam instructions. Candidates are advised to carry a valid photo ID proof along with the hard copy of the JIPMER PG entrance exam admit card 2017. Search for the Admit Card link in the notification section. Select the course whose hall ticket, you want to download. Enter user ID and DOB in the shown request form. Jawaharlal Institute of Postgraduate Medical Education and Research has released the date for the JIPMER PG entrance exam 2017 and the exam will be conducted on 21st May 2017. Candidates looking for the JIPMER PG Hall Ticket 2017 will be able to download their exam admission letter from 03rd May 2017 and they will be able to download it until the date of exam conduction. For any type of assistance, while downloading the JIPMER PG Admit Card 2017, candidates are advised to contact us by commenting at the end of the post.